I would like a decent telecaster body with good wood (mahogany, ash, alder, no basswood) and a really playable neck prefably being maple on maple (fretboard). I'm not bothered about the electronics pickups wise due to having replacements and the hardware may be replaced. In summary I want decent tonal wood and a maple playable neck under £150. Rondo Music make what are widely considered the best cheap guitars for modding/upgrading. For a decent Tele copy you'd be looking at their Furrian model. Solid alder body and maple neck. Great out of the box, but if you're swapping out the pickups and hardware then it can be even better. However, as I assume you live in the UK, you'll have to contact Rondo about shipping. As far as I know they do ship to western Europe so it shouldn't be a problem. If for some reason you can't get hold of a Furrian, there's always the Squier Affinity which earned a place on the cheap Telecasters page. The Affinity has an alder body and maple neck. The neck on the affinity is slimmer than your standard Tele so you might find it more playable especially if you have small hands/short fingers. Also worth considering is the Legend LTE-T Tele Copy. 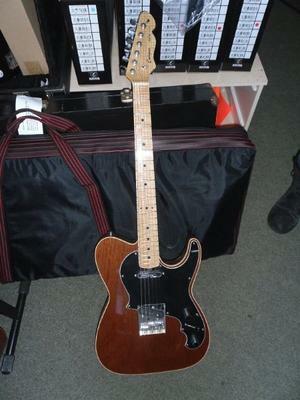 It does have an alder body and maple neck but with a rosewood fingerboard so I'm not sure if that would rule it out. I've played a couple of Legends in the past and they match Rondo's offerings as far as "bang for buck". They would make great project axes. There's also more of a custom shop feel to them - they're a small company and don't mass produce, which generally means more attention to detail, more careful selection of materials and a more unique instrument. If anyone has any further suggestions, please use the comments form below.